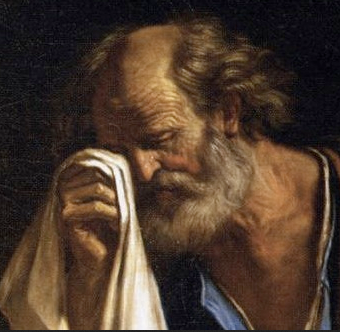 Detail of "St. Peter Weeping Before the Virgin"
I am always moved by the story of Peter denying Jesus. Perhaps one of the reasons is because I know in my heart of hearts this could so easily have been me. Could Peter have avoided this denial by, say, staying away from the fire of his 'enemies'? He was, after all, in the high priest's courtyard, the leader of the band that felt threatened by Jesus' popularity, saw Him as a liability to their cause, and wanted Him dead. Perhaps. But in the end, I believe Peter needed to confront his cowardice (or whatever it was). He needed to see inside himself in the way that only such an incident would make possible. The same can often be said about the denials we make that surprise us. We think we are way past giving in to the temptation to fudge the truth, or slander someone, or turn tail and run. And then we do it and see this bent toward sin is still in us and, like Peter, we "weep bitterly." But now we can also deal with our misplaced self-confidence. No more Peter-like bravado: "Lord I am ready to go with You both to prison and to death" (Luke 22:33). Rather, we can have hope for our increased Kingdom usefulness when we return to Jesus with the lessons of our detour burned deep into our spirits. May it be for us as Jesus predicted it would be for Peter: "… when you have returned to Me, strengthen the brethren" - Luke 22:32. PRAYER: Dear God, it is a bitter experience to see my own soft spots and sinful tendencies. When I fall into sin, please help me to quickly return to You and then use my experience to strengthen others. Amen. "There are experiences like this in each of our lives. We are in despair, the despair that comes from actualities, and we cannot lift ourselves out of it. The disciples in this instance had done a downright unforgivable thing; they had gone to sleep instead of watching with Jesus, but He came with a spiritual initiative against their despair and said - 'Arise and do the next thing.' If we are inspired of God, what is the next thing? To trust Him absolutely and to pray on the ground of His Redemption.